Helping you build better relationships with your customers. By delivering personalised communications along the customer journey. Personalised Marketing is one of the most important trends to hit marketing over the last few years. Personalised marketing gives your customers and potential customers a unique, memorable experience and builds a bond; it lets them know you are paying attention and understand what they want and need. Today’s customers expect personalisation, and brands who use data-driven, personalised marketing campaigns to deliver this are seeing the results. It’s easy to put someone’s first name into an email or a printed piece of marketing collateral, but advances in technology now allow for so much more than that to deliver a real ‘personalised’ experience. With brands now having so much data on their customers many are using this to tailor and personalise the content too – and not only that, deliver those messages at specific and relevant times to the individual to provide a genuinely one-to-one experience, utterly unique to them. 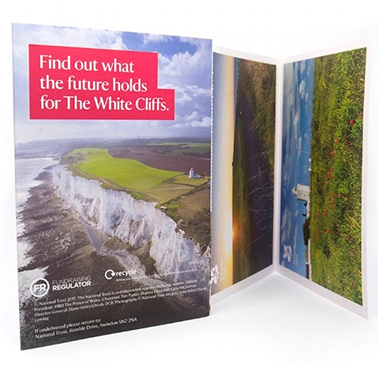 The White Cliffs Appeal Campaign had a very tight turnaround but was for a great cause and needed a quick response - which we duly delivered. We have invested in the latest technology to deliver on our customer's desires to implement personalised marketing campaigns of varying kinds, whether it be for Kellogg’s for a personalised spoon for over 1 million of their customers, or for Vets4Pets for personalised multi-channel CRM programme, or The National Trust using personalised direct mail to secure £1m of donations in a 3-week window.